Ukoliko želite pročitati ovaj tekst na hrvatskom jeziku kliknite ovdje. Having listened to the summary of the Appeal Judgment and having stood up to hear the litany of crimes affirmed by the Appeals Chamber before his sentence of 20 years was upheld, General Slobodan Praljak took his own life by drinking poison – but not before expressing his utter contempt for the Judgment, and by extension, his contempt for the Judges and the ICTY as a judicial institution. Questions abound. How did General Praljak smuggle the vial of poison into the courtroom? How could he have gotten it through the numerous check-points where he would have been searched? Did he have it on him when he arrived at the ICTY? Did someone smuggle it to him there? Or, was it waiting for him at the ICTY, secretly planted in his cell or in the toilet? Relevant as these questions are, few are asking what I think is perhaps the more important question: why did General Praljak take his life? General Praljak had spent about a dozen years in the United Nations Detention Unit (UNDU). With credit for the time served, he would have been eligible for early release within two to three years, and would very likely have been released before serving his full sentence. But detention never troubled General Praljak. Unlike the other accused in his case, he refused to be provisionally released under house arrest. It was a matter of principle. And when it came to his principles, he was stubbornly uncompromising. His argument would be: if I am presumed innocent, if I voluntarily came to the ICTY upon hearing of my indictment, if the Croatian government was offering a guarantee for my return to the ICTY, if my every movement while on provisional release in Zagreb will be shadowed by the police, and if I have complied with the conditions of my provisional release in the past, then why should I now be under house arrest as a condition of my provisional release? Of course, he wanted to be in his home with his wife, children, and grandchildren who he adored, and who adored him. But it was the principle of it – a principle he was willing to adhere to, come hell or high water. And for that I admired General Praljak. He unsentimentally walked his talk. Reflecting on General Praljak’s final moments, I believe it was his principles that drove him to take his own life – not fear, not anger, not depression, not desperation, and certainly not any of the other reasons that cause a person to seek peace through suicide. General Praljak was no romantic fool; he did not harbor illusions that his conviction would be overturned. Any objective observer would have come to the same conclusion. I certainly did. At best, the Appeals Chamber might have reduced the sentences, but the convictions, for the most part, would stand, even though, in my opinion, the evidence does not support the factual findings and legal conclusions made by the Trial Chamber. This is particularly so with the claim in the indictment of an overarching joint criminal enterprise (JCE) to reconstitute the Croatian Banovina within its 1939 borders, so it could either join Croatia or be an independent state within Bosnia and Herzegovina (BiH) with close ties to Croatia – and that this JCE involved permanently removing and ethnically cleansing Bosnian Muslims and other non-Croats who lived in these areas. Convicted persons on appeal, generally, are susceptible to irrational hope, unsubstantiated rumors of behind-the-scenes machinations of friendliness and supposed efforts to steer the judges in a favorable direction, or false claims of exoneration (usually couched in language that is sufficiently vague to allow plausible deniability) – claims that are sometimes peddled by charlatans posing as high-powered lawyers seeking to make a quick (and exorbitant) fee. General Praljak had no patience for any such nonsense. General Praljak was rational, intelligent, and pragmatic. His thinking was shaped by the hard sciences, even though he was equally versed in the soft sciences or liberal arts of philosophy, sociology, history, literature, theater, and cinema. 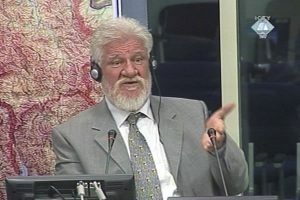 Though I am assuming that General Praljak hoped and perhaps expected (as my client, Dr. Jadranko Prlić, did) that he would get a fair trial at the ICTY, it should have been obvious to him either before arriving at the UNDU, or sometime shortly thereafter, that convictions on most of the alleged crimes were predestined. Croatia’s generosity in helping the Muslims of BiH at a time when Croatia was one-third occupied and fending for its very survival against the rump Yugoslavia and its highly trained and armed Yugoslav People’s Army. General Praljak’s expectations – as legitimate as they were – were not met to any degree of satisfaction. I know, because since early 2005 I represented Dr. Prlić in this case. He too harbored expectations of a fair trial – as all accused appearing before any judicial institution should, especially when being tried at a tribunal founded by the United Nations. Granted, I may not be the most objective observer, and it can be claimed that I have a considerable interest in this case, which consumed over 12 years of my career. Be that as it may, I can say with full responsibility that what I witnessed during the trial was a parody, a charade, theater of the absurd disguised as a trial. Everyone who was at the ICTY saw it. As I repeatedly complained to the Judges during the trial, none of them, nor any of the Judges at the ICTY, would want to be tried in the way my client was being tried. If there is one case, one trial, and now, one appeal that stands out as part of the dark legacy of the ICTY, it is Prlić et al. It is a textbook example of how not to try a case, how not to select the panel of trial judges, how not to conduct the trial proceedings, how not to analyze the evidence, and how not to draft a judgment. It is also a textbook example of why convicted persons cannot and should not expect that the errors and sins of the Trial Chamber will be exposed with unrelenting precision, brutal honesty, and unvarnished integrity, especially when to do so would require the Appeals Chamber to reexamine virtually the entire record (in this case, 52,967 pages of trial transcripts, 818 written decisions, and 5,926 exhibits admitted over five years of trial proceedings). But that is exactly what the Appeals Chamber should have done in Prlić et al. – especially when the Defense handed them the needles of errors hidden in the massive haystack of a record. How naïve it was to think that the result of this case would have been any different! The ICTY – as a judicial institution – had already adjudicated many of the alleged major issues confronting the accused in Prlić et al., such as whether the Muslim-Croat conflict in BiH was an international armed conflict, whether Croatian President Tuđman and his government were attempting to carve up BiH, whether the Croats in BiH set up a statelet that would either be autonomous or part of Croatia, and whether there was ethnic cleansing of the Muslims in BiH – all of which was claimed to have been part of some grand scheme, a master criminal plan, a JCE. Though I may not be the most objective observer (as I have already noted), I am convinced beyond doubt based on the evidence submitted during the trial that there was no JCE, no statelet, no efforts to carve up BiH, and no ethnic cleansing, etc. I fully recognize that errors were made, that serious crimes were committed against soldiers and citizens, and that there must be accountability. But as far as the prosecution’s overarching theory that there was a JCE to reconstitute the Croatian Banovina within its 1939 borders, and that ethnic cleansing occurred to achieve this goal, I simply do not see anything more than, at best, circumstantial evidence that points to this as just one of many inferences that can be drawn. The republic’s [BiH’s] strategic position made it subject to both Serbia and Croatia attempting to assert dominance over large chunks of its territory. In fact, the leaders of Croatia and Serbia had in 1991 already met in a secret meeting where they agreed to divide up Bosnia and Herzegovina, leaving a small enclave for Muslims. … Bosnian Croats soon followed, rejecting the authority of the Bosnian Government and declaring their own republic with the backing of Croatia. The conflict turned into a bloody three-sided fight for territories, with civilians of all ethnicities becoming victims of horrendous crimes. In light of these claimed facts on the ICTY website, can it be said that the accused in Prlić et al. truly enjoyed the presumption of innocence? For years this text has been part of the ICTY narrative for public consumption. It was not drafted by accident. Nor is it likely that it was posted and paraded about without the express approval of the presidents of the ICTY. Incidentally, sitting on the Appeals Chamber in Prlić et al. were two former presidents (Judge Theodor Meron and Judge Fausto Pocar) and the current president, Judge Carmel Agius. This narrative invariably served as the subtext during the trial. How could it not? When reflecting on how the trial was conducted and how some of the accused were treated (especially General Praljak, who was not shy in expressing his opinion), it is clear as crystal from day one that none of the accused in Prlić et al. stood much chance of a fair trial and a just outcome. Questions or comments that came from some of the Judges displayed a pro-prosecution bias, such as calling the Croatian Defence Council the “Catholic army.” Occasionally, the Judges commented on the evidence, prejudging it based on their supposed personal knowledge.1 See e.g. Prosecutor v. Prlić et al., IT-04-74-T, Transcript, 10 May 2006, pp. 1757-58. The list goes on. systematically denying Dr. Prlić adequate time and facilities to question critical witnesses and present essential evidence by applying a one-sixth-solution: all six defense teams would collectively have the same time for cross-examination as the prosecution would have for direct examination for each witness (Ground 7). And so, it was deeply disappointing, indeed shocking, to hear Judge Agius read the summary that was carefully crafted for public consumption (since few, if any, will read the 1400-page Appeal Judgment) stating that Dr. Prlić’s sole fair trial right claim was that he was “systematically denied adequate time and facilities to question witnesses.” Whoever wrote that summary for his Honor was clearly ignorant of the details of the appeal. These mischaracterizations of the fair trial errors raised by Dr. Prlić in his brief are simply propaganda. They lead to the intended consequence of facilitating a fictitious perception in the public’s mind that, save for this belly-aching claim of not having enough time to present his case – something that is too amorphous and imperceptible for the public to fully appreciate – Dr. Prlić was content with how the evidence he presented was assessed. Prlić never unconditionally requested that his case be reopened and, in any event, the Trial Chamber expressly permitted him to admit evidence to rebut these diary extracts, which he did. General Praljak was likewise offered an opportunity to challenge these extracts. This mischaracterizes the record. After the close of evidence, the prosecution sought to reopen its case to tender into evidence excerpts from the Mladić Diaries, which were found in Mladić’s residence in Belgrade by the Serbian authorities. In response, Ms. Suzana Tomanović and I argued that the prosecution’s case should not be reopened, but if reopened, Dr. Prlić should be afforded an equal right to reopen his case and have admitted excerpts of the Mladić Diaries relevant to his defense. It would have been contrary to logic and common sense for us to open the door and move for the Mladić Diaries to be admitted without the prosecution’s motion being granted. But, seeing as how the prosecution’s excerpts were coming in (the Mladić Diaries were newly discovered evidence), we requested the Trial Chamber on several occasions to admit excerpts relevant to Dr. Prlić’s defense. How many times should the same request be made before it can be considered “unconditional”? This was only one of the issues raised by Dr. Prlić. Not that I wish to relitigate the point, but some sunshine on one particular entry in the Mladić Diaries is worth examining. You be the judge as to whether this is how a reasonable trier of fact should admit, assess, and rely on uncorroborated hearsay evidence. The Majority admitted and relied on excerpts from the Mladić Diaries, which contained quoted remarks purportedly attributed to General Praljak, in making JCE findings – excerpts that directly implicated Dr. Prlić. General Praljak’s statements are uncorroborated hearsay. Mladić did not testify. No prior testimony had been elicited concerning these meetings, and no witnesses testified to the meetings. 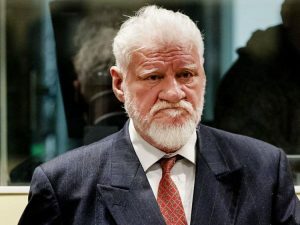 General Praljak’s request to reopen his case and testify concerning the meetings with Mladić and the statements attributed to him in these extracts was denied. In denying his request, the Majority’s suggestion that General Praljak’s counsel vouch for General Praljak in the closing brief and testify during closing arguments in lieu of viva voce testimony from General Praljak was absurd. Even law students know that counsel cannot testify and representations by counsel in closing briefs and closing arguments are not evidence. And what of Dr. Prlić’s right of confrontation, his right to question General Praljak on what he purportedly said or meant? These points may seem inconsequential, but I think not. Here is why. Even if the Appeal Judgment addresses all the fair trial right challenges raised by Dr. Prlić, that is beside the point. What is relevant is the false perception these segments of the summary read to the public created – intentions aside. And speaking of perceptions, anyone who witnessed the trial would attest to just how dysfunctional the Trial Chamber was, with two of the Judges often publicly quarrelling with the Presiding Judge, who seemed incapable of managing the trial proceedings. None of the Judges were up to the task, and it was obvious. Their rampant intervention while the parties were conducting their examinations led me to invite the Judges to either conduct the proceedings properly and in accordance with the letter and spirit of the ICTY Statute and the Rules of Procedure and Evidence (and refrain from inappropriately interfering as they had been doing), or to pack their bags and go home. And since they seemed clueless on how the proceedings should be conducted, I further requested that the Judges allow the prosecution and the defense one hour each to lecture them – since both the prosecution and defense had considerable experience in trying cases at the ICTY.2 Prosecutor v. Prlić et al. ICTY-04-74-T, Transcript, 14 March 2007, pp. 15628-33. Cheeky as this may seem, my request was granted, and submissions were made.3 Prosecutor v. Prlić et al. ICTY-04-74-T, Transcript, 22 March 2007, pp. 16139-85. The proceedings improved somewhat after this intervention and training session, but overall, I can safely say that in my 35 years as a lawyer, the Prlić et al. trial was the absolute worst experience I’ve ever had as a lawyer. But why should this matter and how does it account for General Praljak taking his own life? It matters because, had the Trial Chamber been balanced and measured in their treatment of the defense, had they not adopted the unreasonable approach of allowing the six accused to have only a combined amount of time equal to the time allotted to the prosecution for every witness, had the Judges been more patient with General Praljak and allowed him greater latitude in questioning witnesses (after all he was in situ on the matters on which he wanted to confront the witnesses), had they not virtually wholesale ignored the defense evidence, and had they drafted a judgment that represented the evidence submitted during the five-year trial, then, perhaps he may have accepted the findings and conclusions. Perhaps, General Praljak might have accepted that he may have erred during the fog of war as he tried his best to command and control a citizen-soldier army led by a few professional officers of ranks that exceeded their experience and competence. I say this because of the time I spent getting to know General Praljak before the trial and observing him for over a decade as the case progressed through the trial, all the way up to his last day. General Praljak was fearless. He was not afraid to be held accountable for any acts of commission or omission – so long as the evidence bore out his responsibility. He took the stand and testified for over three months. He did not equivocate, did not feign an absence of memory, and he certainly did not try to shift the blame. General Praljak did not suffer fools, perhaps because his intellect was off the charts, not because of a superiority complex or arrogance. At times, however, he could be contentious, vociferous, and cantankerous. He had an overwhelming presence bursting with energy and determination to expose what he knew, what he saw, and what he felt about the events he had experienced. Sometimes his exuberance to get to the truth or to set the record straight got the best of him as he would stray or get carried away, depending on the topic being discussed. Occasionally, he had difficulty seeing the trees for the forest. And yes, occasionally, he could be exasperatingly difficult to contain, just as he exasperatingly had difficulty containing himself when hearing nonsense masquerading as facts. If I have learned anything in representing accused in highly contentious and stressful trials, unless the judges are courteous, considerate, patient, and solicitous, an accused will be hard pressed to accept a ruling or final judgment, irrespective of the quality or sufficiency of the evidence. But when also factoring in how the case was tried, the way two of the Judges interacted with General Praljak, the way they often condescended to him, and of course, their ultimate findings and conclusions in the judgment and how these were reached, is it any wonder that General Praljak would challenge the even-handedness of the proceedings, or that he would reject the Trial and Appeal Judgments with contempt? General Praljak’s final act casts a long shadow over the factual findings and legal conclusions made by the Trial Chamber and upheld by the Appeals Chamber. The evidence, for the most part, is available for scrutiny for anyone interested in judging the Judgments. Of course, few, if any, will take the time to go over this material to see what is proved, what is speculative, what is true, and what is false. But no one should be gulled into imagining that General Praljak exited the field as a concession to and acceptance of the findings of his guilt, or because he feared continued incarceration. Rather, his sacrifice was the ultimate repudiation of the injustice with which he was tried and judged. Some will look at the Judgments in Prlić et al. and find vindication and perhaps even solace. Others no doubt will reject them as General Praljak did, perhaps with an equal amount of contempt. But what is for sure is that these Judgments will not foster reconciliation any more than it can be claimed that they represent the historical truths of what happened in BiH during the Muslim-Croat conflict. General Praljak’s suicide was an act of defiance that has shed light on the ICTY’s legacy. No amount of spin will erase the tragic event that occurred in Courtroom 1 on 29 November 2017. What was expected to be the ICTY’s swan song – ending by reaffirming the convictions in Prlić et al. just days after the Mladić trial verdict – turned into a sad and confusing sight. General Praljak preferred to take his life, rather than validate the result of the trial and appeal proceedings – proceedings that in his view produced a false narrative based, in part, on the Judges’ unwillingness or inability to look beyond the settled orthodoxies that were touted on the ICTY website and peddled by its Outreach Program, even as the proceedings were ongoing. 1. ↑ See e.g. Prosecutor v. Prlić et al., IT-04-74-T, Transcript, 10 May 2006, pp. 1757-58. 2. ↑ Prosecutor v. Prlić et al. ICTY-04-74-T, Transcript, 14 March 2007, pp. 15628-33. 3. ↑ Prosecutor v. Prlić et al. ICTY-04-74-T, Transcript, 22 March 2007, pp. 16139-85. 4. ↑ In the Matter of Mr Toma Fila, IT-13-93-Misc.1, Decision of the Disciplinary Panel, 23 October 2012, para. 70. Fascinating stuff. And disheartening. Its amazing the discrepancy between the information a casual observer like me obtains through the NY Times and the perspective offered by a defense attorney intimately familiar with the true goings on. While it is the author’s right to criticise the proceedings, even in such strong terms, I believe this is a colourful exaggeration. The claim that “everyone […] saw it”, moreover, is wildly inaccurate: to the best of my knowledge, the author’s view is not shared by all – or even the majority of the people who have a legal background and some knowledge of that trial. Criminal defence, however, can become a very personal matter for an attorney (even though probably it shouldn’t). It would be unrealistic, in my view, to expect someone who has dedicated 12 years of his life to that trial and to his client to be completely objective about it. There is no such thing as a neutral standpoint. The position of an observer always inevitably affects how she sees the events unfolding before her. A number of Mr Karnavas’ observations in this post are, however, difficult to disagree with. Let’s start with the trial bench: International criminal tribunals have always been – and still are – plagued by the political nature of the judges’ selection process. Like all appointments of political nature in international organisations, quality, experience, and merit are not always the guiding stars followed in that process. One of the judges on the Prlić bench had no previous experience in national or international criminal proceedings. None whatsoever. He was, in fact, a diplomat. This choice is inconceivable in a criminal trial of such importance and magnitude, and may not have been inconsequential to the accused’s right to receive a fair trial. This was also not an isolated case at the ICTY, with many judges having only been law professors before being called to manage complex multi-accused trials at the ICTY. Appropriately, the ICTY Statute requires lead counsel to possess 10 years’ experience in criminal law to be granted right of audience before a Chamber (seven years for co-counsel). It’s thus difficult to understand why the drafters of the Statute deemed it appropriate for a jurist without any criminal trial experience to decide of the fate of the accused in these maxi trials. The other two judges in the Prlić case, however, did have experience, and while Mr Karnavas may not have liked them, this may have something to do with Mr Karnavas’ expectations as a lawyer trained in a purely adversarial setting rather than with the judges’ ability to properly manage the trial and deliver a just verdict. The Mladić diaries: This piece of evidence was discovered quite late into the proceedings. Their apparent probative value was clearly appealing to the Trial Chamber. Mr Karnavas states that their admission at the prosecution’s request, and the denial of the defence’s request to tender their own excerpts of the diaries sacrificed fairness on the altar of expeditiousness. However, in assessing the actual prejudice created by this decision, one needs to consider that the Trial Chamber at the ICTY is not only the “referee” of the proceedings, but also the trier of fact. If the Chamber decided not to admit additional parts of the diaries, it did so after looking at their prima facie relevance and probative value. It’s thus unlikely that, if admitted, those excerpts would have changed the Trial Chamber’s mind on the facts to which the diaries related. More troublesome is the Chamber’s denial of the request to hear General Praljak’s testimony on the content of the diaries. The suggestion that Praljak’s counsel could have addressed the issue in her closing arguments (I will take the author’s word for the accuracy of this account) was blatantly offensive to the fundamental principles of evidence, and considering the Chamber’s reliance on the diaries to establish Praljak’s responsibility through JCE, this decision may have caused actual prejudice to the accused. Unlike with the diaries’ excerpts, which the Chamber had the opportunity to read before denying their admission, the Chamber could not have assessed the value of General Praljak’s testimony before actually hearing it. Provisional release: Imposing house arrest on someone who had voluntarily surrendered, behaved exemplarily while in detention and during trial, and for whom the Croatian government had vouched, was wrong and in plain contradiction with the principle of presumption of innocence, which was evidently sacrificed on the altar of public perception. Essentially, that choice was punitive in nature, rather than dictated by the need to avoid the accused’s flight, reiteration of a crime, or other legitimate reasons. Unfortunately, this is something which we see way too frequently in both national and international jurisdictions. Finally, the glaring bias of the majority of ICTY’s outreach has always been baffling to a lot of observers familiar with the basic principles of criminal justice. Aside from the narratives pointed out by Mr Karnavas, outreach materials included leaflets of metal handcuffs printed beside ligatures found on victims of executions buried in mass graves. They were disseminated throughout the building and provided to visitors before they entered the courtroom’s public gallery. The message they conveyed was simply incompatible with the principle of presumption of innocence. The same type of outreach would be unfathomable in a national court in relation to ongoing trials, and rightly so. These pictures made groups of visiting national criminal lawyers extremely puzzled and uncomfortable. I believe complaints were lodged by the Association of Defence Counsel practicing before the ICTY, but to no avail. One of the reasons behind this type of outreach might be that international courts such as the ICTY are created not only to assess criminal responsibility, but also for educational and reconciliation purposes. The way in which to achieve these objectives is generally left to the discretion of media experts, not criminal law experts. The lack of proper judicial oversight over such activities is most regrettable for a plethora of reasons, including the fact that reconciliation itself is jeopardised if part of the public sees bias in the way the court operates. It is not my intention to take position on the overall fairness of the Prlić et al. trial, nor do I intend to speculate on the reasons behind the choice of General Praljak. I agree with Mr Karnavas, however, that the fact that he only had two or three years left to serve before regaining his freedom cannot be overlooked when trying to make sense of what happened. For me it is a hard to estimate all juridic fine details this case involves, but what I as a Croatian citizen (from Croatia not Croat from Bosnia and Hercegovina) experienced is unjustifiably great discrepancy between prosecution and defense that are being reflected as an almost unlimited political influence of the prosecution in comparison with the defense. Direct political influence on Croatia (other involved countries indeed) political processes. I truly believe this influence in its intensity and durability push out all other expectations and was a main reason this case lasts too long and was as Michael G. Karnavas explicitly described. Shocking suicide of General Praljak is indeed breaking point, but what all happening behind the political instrumentation of ICTY during 13 years of this case and including connected cases during almost 20 years are not less shocking even mostly not foreseen. Unfortunately, after conducting a simple “Google Search” I did not find much critique on the manner in which the ICTY was delivering justice. Your article puts something out there for people with a more critical mind to read, and then hopefully consider the theory that there was no Croatian JCE, and that justice has not been adequately served. I would like to add that there are many Croatian victims from villages in BiH for whose deaths no one has answered, and never will. This would require people from Army BiH to be tried. Just to name a few of these villages: Uskoplje, Busovača, Lašvanska Dolina, Konjic, Zenica, Travnik, Vitez, Kakanj, Jablanica. Why do these Croatian lives matter less? I guess if the people responsible for their deaths were appropriately tried and sentenced by the ICTY, they would indeed have to rethink their outreach material, and exhibition posters. Do any of these posters mention that Croatia, now the only nation labelled as an aggressor in BiH, prevented Serbs from commiting a massacre in Bihac, potentially larger than the massacre they committed in Srebrenica? Even sadder is the way Prilic et al. were treated and betrayed by certain members of their own nation. As a Croatian my heart breaks. The plight for independence from a Serb-dominated Yugoslavia that so many lost their lives for has now amounted to Croatia being slapped with a JCE conviction, and a tragic event in an unjust courtroom run by poorly qualified judges. Sefer Halilovic, Rasim Delic, Enver Hadzihasanovic and Mehmed Alagic, all high ranking ABiH officers, were indicted by the tribunal. No indictments of former ABIH officers, or the subsequent convictions in the cases of Delic and Hadzihasanovic, reach the gravity of the accusations leveled by Croatian nationalists against the military-political establishment of Bosnia-Herzegovina: the most reckless coming from Jadranko Prlic and it being that Bosniaks – not Serbs – started the war in BiH, objectionable given well established chronology of the events in Herzegovina circa October 1991 when the JNA shelled Ravno and Mostar and I dare say problematic for the more mainstream Croatian narrative on the war’s causes which notably departs from that of the Herzeg-nationalists. Do any of the people uncritically parroting the HTV talking points that Croatia “prevented Serbs from committing a massacre in Bihac, potentially larger than[…] in Srebrenica” understand that, first, Bihac housed five thousand ethnic Croats, some of them refugees from “Krajina” or Serb-occupied Croatia, who were defended by the Muslim-dominated 5th Corps from the beginning of the war in Bosnia until Storm, that, second, besides RSK and VRS forces Fikret Abdic’s APWB militia (in fact under RSK and SDB control) was participating in offensives against Bihac, and they were politically supported, armed and funded by Croatia which for some time fancied Abdic as a viable alternative to the government of Izetbegovic (and praised by Praljak no less in his trial – take it for what you will), and that, last, the Muslim-Croat conflict in Central Bosnia and Herzegovina diverted ABiH forces that would have been used against the Serbs in Posavina, Eastern Bosnia and Central Bosnia to potentially save the enclaves of Bihac, Zepa and Srebrenica and to break one of the key supply lines to the RSK? You are positing the affirmative of what is precisely in question, whether Croatia’s involvement in Bosnia was on the whole beneficial for Bosnians, for Bosnian Croats and/or for Bosnian Muslims: if Muslims in fact started the Muslim-Croat according to a premeditated plan and the HV supported them in 1994 and 1995 and before then notwithstanding, preventing further carnage in Bihac as you say, then one certainly concludes that it was; if the Muslim-Croat conflict was however started by Croatia and/or its proxies in Bosnia-Herzegovina as Bosnia was in the midst of emerging humanitarian crises in Zepa, Srebrenica, Gorazde and Bihac which the Bosnian government was struggling to handle militarily, Croatia and/or “HZHB” may be seen as being partly responsible for the outcomes in these places and cannot play noble cavalry over the hill. Profoundly grateful to you for your work in defending the interests of Bosnian Croatians, (specifically General Praljak), and for this insightful piece on the machinations of the ICTY. I hope this article is passed on to anyone interested in the ICTY, any international students of law, anyone from Croatia/Bosnia-Hercegovina, and of course reporters who covered the wars there. Sadly, reporters seem to run from such truthful analyses. Please, please, please write a book about this experience. I will be the first one to buy several copies! PS. If you are ever doing any speaking engagements about this topic please do let us know. Thank you for this post – you are apsolutely correct! It is unfortunate that real victims were not satisfied. Also, how can one trust similar Court decisions in other cases, those we are not familiar with (other parts of the world) . No one denies atrocities on all the sides, every victim needs to be recognized. Mr. Praljak was prepared to admit his wrong doing , but Court failed to showed him his wrongdoing. I was watching Mr. Praljak ( YouTube) questioning witnesses – he was brilliant, clear, precise. I am not a legal expert, but I imagine there must be some review ol all this mockery of justice. It unfortunately planted seeds for further conflicts. BiH was never in worst and dangerous shape as it is now. The radical Muslims are ” getting ready” ! First, let’s start with the reason why this so called tribunal was established, and who were the powers behind it. As we all know, before, during, and after the breakup of Communist Yugoslavia there were, and still are going on, many wars in many parts of this world, in which one or all sides commit crimes such as; ethnic cleansing, persecutions and killings of civilians, torturing and other atrocities. But, since the establishment of the UN (excluding the Nuremberg Tribunal), there apparently was no need for such international court for any of those wars except the one that destroyed an artificial state of Yugoslavia, an American, British and bolshevik creation at the end of WWII. The answer is very simple. Notwithstanding the democratic elections in Croatia 1990, and declaration of independence after Serbian aggression in June 1991, her creators could not accept the demise of their pet state. So they tried everything in their power to find the way to punish those who they deemed responsible for destruction of their Potemkin’s Village of “Communism with human face”. When after four years of their embargoes on weapons, Vance-Owen and “Z-4” plans could not save their pet state, they decided to create a mini Yugoslavia, now known as Bosnia and Herzegovina, consisting of two entities, one Serbian and one Muslim. Even though they were the first to rise to defend Bosnia from Serbian aggression, Croatians of Bosnia and Herzegovina, were treated, and still are, as if they did not exist. One of the first ones to take up arms to defend Bosnia and Bosnian Muslims was Slobodan Praljak. Unfortunately, many in the ranks of those Muslims, Bosniaks, or whatever they now call themselves, are murderers of innocent civilians, and their leaders islamist extremists and perfidious liars. Even though they know who they are, not one among those “righteous” UN clowns, their judges and prosecutors, has found any reason to, at least, question some of them. General Slobodan Praljak, as the author states, has never defended himself. He did not have to not just because he was completely innocent, but because like many of his fellow-countrymen before him, he was always ready to choose death over dishonour. As other Croatian heroes has shown through past centuries, with his ultimate sacrifice Slobodan Praljak has shown the world at large that he was a worthy heir of Croatian heroes, such as Nikola Šubić Zrinski, who with 2,300 of his brave soldiers in 1566 at the battle os Siget fought Otoman army of 300 thousand wariors. After months of fighting and number of fruitless all-out assaults the Turks offered Zrinski a chance to surrender. If he had done so, they promised to make him a king of Croatia. He, of course, declined, and with remaining 800 warriors, on September 7, Zrinski and his men prepared to face their enemy and an almost certain demise. The last of the defenders did not go down easily, killing thosands of the attackers before they fell. They stood their ground Zrinski was killed, struck by Ottoman bullets and arrows. His body was decapitated, and his head brought as a gift to the new Sultan. Although the battle was over, Zrinski had one last victory. He had ordered a booby trap to be set in the castle, and when it was stormed by the Turks it exploded, taking the life of an estimated 3,000 Ottomans. The heart that was beating in the chest of Slobodan Praljak was the heart of Nikola Šubić Zrinski.